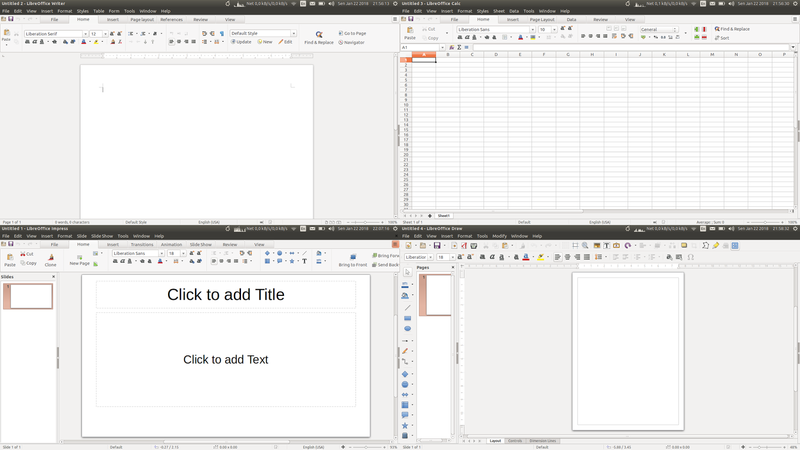 This is a short preview of how Notebookbar will look like on LibreOffice 6.0. 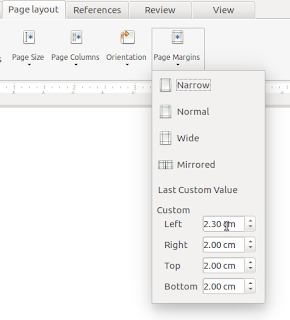 Notebookbar is a new toolbar appearance on LibreOffice since version 5.3 that look similar to Microsoft Office 2007 Ribbon Toolbar. It's tabbed, column based, and categorized. We can use Notebookbar on Writer, Calc, and Impress already. It's still a experimental feature for now, so it's not recommended for production use. 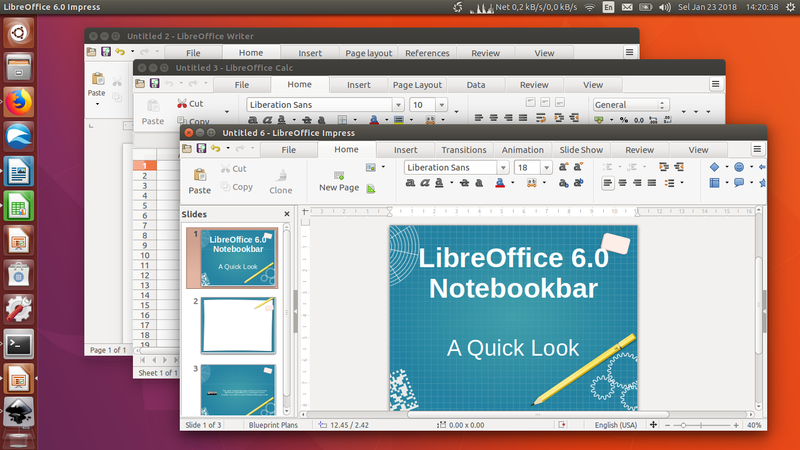 However, it's already good looking at LibreOffice 6.0 and we need to see more. I show here screenshots of Writer's Notebookbar from all tabs with some commentary. Here a picture showing Writer, Calc, Draw, and Impress in clockwise direction from top-left. The main modules (Writer, Calc, Impress) are shown with Notebookbar while Draw with Default toolbar. Note that the Menubar enabled in each module (it can be disabled as well). Most frequently used functionalities shown here. It's placed on second position from left rather than first. Each button is not bordered, huge button is also not bordered. 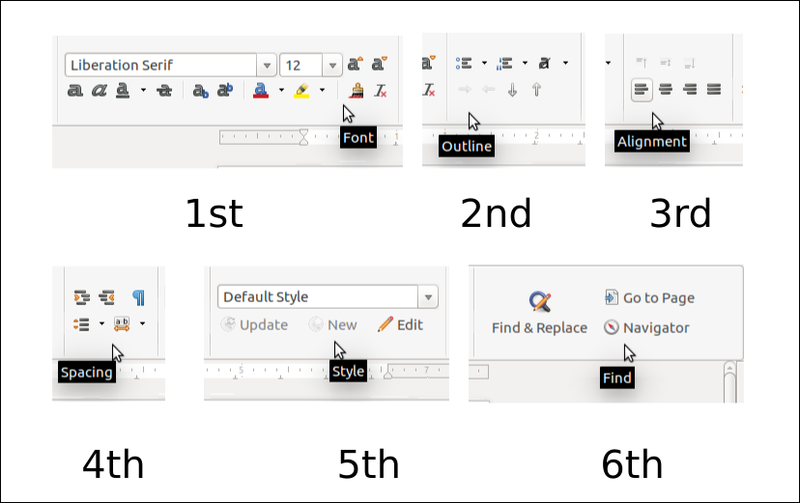 See for example formatting buttons (a a a ...) below 'Liberation Serif' in the picture are not "embossed" nor grouped-with-border (so you must hover it to see if it's a button). See also huge Find & Replace button at right side is not bordered or easily seen as different thing. You can compare Word 2007 picture: Office2007ribbon.png (Wikipedia). 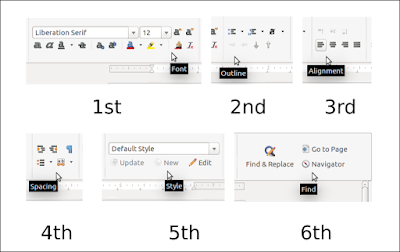 Functionalities of Standard Toolbar shown here. New, Open Save, Save as PDF, Open, and Print, are here. Functionalities of Insert Toolbar shown here. Table, Chart, Special Char., Shapes, Page Number, are here. Functionalities of 'menu Format > Page' or 'right-click > Page' shown here. Left indentation & paragraph spacing inputs. 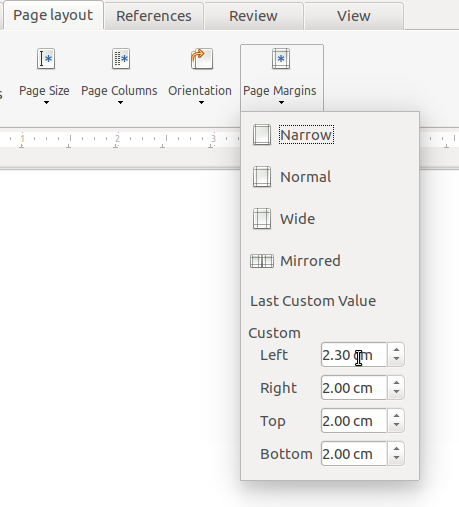 Page Margins, Page Settings, Page Size, are here. Functionalities of menu Insert for referencing are here. Table of contents, Index, Footnote, Bibliography database, Cross-reference are here. Icon missing: Update All, Footnote or Endnote, Bibliography Entry. Comment, Spelling & Auto Spellcheck, Record Changes, Merge & Compare, are here. Icon missing: Word Count, Merge. Functionalities from View menu are here. Normal/Web/Print Preview, Rulers, Grid, Zoom, are here. Icons missing: Hide Whitespace, Ruler. Left-half similar to Writer's one. Right-half specialized for spreadsheet main functionalities. Left-half also similar to Writer's one, right-half specialized for presentation functionalities. When you enable Notebookbar, Menubar disappears, and then a small button with triple-line showing at top-right corner. That is the little menu to help you show Menubar again. This appreach is unique and helpful especially for us testing the Notebookbar. If you're non-developer, you can watch the fine improvement being made but it seems not complete for now. One instance of this is the tooltip on each segment on each tab. 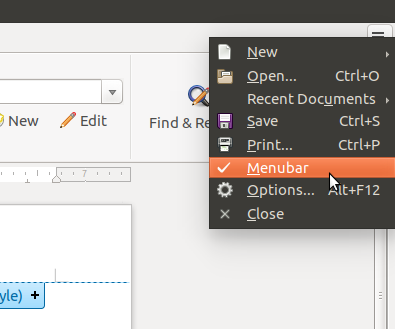 It's similar to Ribbon where Segment Name showing on bottom of each segment, unless in LibreOffice 6.0 it's still in tooltip only. You can feel it like on Word 2007 from left to right: Clipboard, Slides, Font, Paragraph, Drawing, Editing. See picture Office2007ribbon.png. Picture below showing tooltips from Writer 6.0 from Home tab. If you want to help LibreOffice development, you can donate to LibreOffice. If you have programming skills, you can join the development team. Notice that you can also join Design Team. Please share this information to your friends.